Russian short-range ballistic missile. The final refinement of the R-11 design, the R-17, was exported widely and became infamous around the world by its ASCC reporting name - "Scud". It was perhaps the most famous ballistic missile of the post-war period due to its use in the Iran-Iraq 'War of the Cities' and the Gulf War. This was the definitive production version of what was essentially a storable-propellant rocket with the performance of the V-2. The original design was by Makeyev but the missile itself was produced by the Votkinsk Machine Building Plant. AKA: 9K72;9K720;Aerofan;Aerofon;Elbrus;Scud B;SS-1C;Zemlya. Status: Active. First Launch: 1959-12-12. Last Launch: 1990-12-26. Number: 180 . Payload: 1,000 kg (2,200 lb). Thrust: 81.30 kN (18,277 lbf). Gross mass: 6,350 kg (13,990 lb). Height: 13.00 m (42.00 ft). Diameter: 0.85 m (2.80 ft). Span: 1.80 m (5.90 ft). Location: Reutov, Russian Federation. Apogee: 150 km (90 mi). In 1958-1959 Makeyev designed and built the first mock-up of the new missile. But by then the decision was made to devote the bureau to sea-launched missiles, and in 1959 the program was transferred to Votkinsk Machine Building Plant. There design work continued with first launch in 1961 and acceptance into military service in 1964. The R-17 was eventually operated by 27 countries and was known to Western intelligence circles as the SS-1c Scud-B (the SS-1b Scud-A designation having been applied to the Soviet R-11, and the SS-1 designation to the R-1). North Korea reverse-engineered R-17's purchased from Egypt around 1980. Minor improvements resulted in a range 15% better than the Soviet design. This went into production as the Hwasong 5. Following a direct sale in 1985, a production line was set up in Iran, where the missile was known as the Shahab-1. North Korea also exported missiles to users of existing R-17's such as Egypt, Syria, plus new customer Oman. An extended-range version, with 600 km range but half the payload and accuracy was tested from Kapustin Yar beginning in 1965. This received the Western designation SS-1d Scud-C. Competing missiles offered better accuracy, so it was not accepted for production by the Soviet military. However the same concept was used two decades later in North Korea, going into production there as the Hwasong 6. In Iraq, an extended range version of the R-17 was developed as the Al Hussein. A further Iraqi modification, the Al Abbas, achieved an 800-km range by reducing warhead weight to only 125 kg and increasing propellant load by 30 percent. Although different in design from the Soviet missile, these missiles were often referred to in the West as �Scud-C'. In the 1980s, TsNIIAG (Central Research Institute of Automatics and Hydraulics ) began development of an optronically-guided terrain-comparison and map-matching re-entry vehicle for the R-17. TsNIIAG specialists developed software, an optronic guidance system, onboard equipment for the re-entry vehicle control system, ground-based data gathering equipment, and re-entry vehicle targeting equipment. To ensure the reliability of the guidance system in any weather, and over any terrain, a target databank was developed of more than 10,000 images of the Earth's surface made at different times of day and in different seasons of the year. After a series of ground tests the system's equipment components and software were substantially improved. During hundreds of flights, the system's accuracy and operating reliability in any weather and over any terrain were assessed. At the final stage of the tests, missiles fitted with target re-entry vehicles were launched. Their point-of-impact error did not exceed a few dozen meters. The work on the R-17 missile equipped with an optronic guidance system was successfully completed, and the missile was accepted for operational service in 1989 with the designation 9K720 Aerofon. However the collapse of the Soviet Union meant that the missile did not enter service with the Russian armed services. The upgrade was offered for export to R-17 foreign users, but it is unknown if any were sold. The missile received the Western designation SS-1e Scud-D. In the 1990's North Korea developed a further improved version, the Hwasong 7, with a 700 km range, which was also sold to Syria. This was also referred to as the �Scud-D'. The R-17 has been launched in greater numbers than any ballistic missile in war, except the V-2. Small numbers were launched by Egypt against Israel, in 1973; by Libya against Lampedusa in 1986; and in Afghanistan, Yemen, and Chechnya. However the major use was in the wars Iraq waged from 1980-1991. 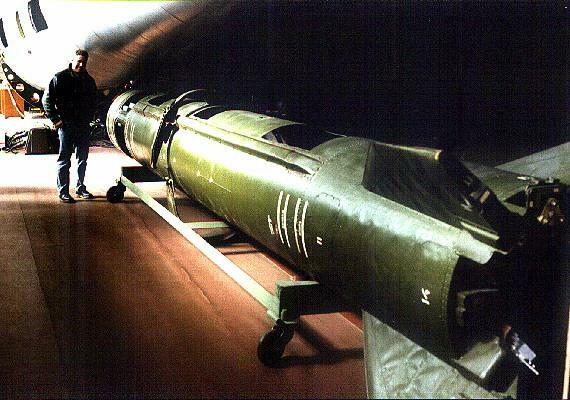 Iraq launched 331 R-17 missiles at Iran during the Iran-Iraq War, and 189 al-Hussein missiles at Iranian cities during the 1988 "War of the Cities." Iran fired a comparable number of Hwasong 5 and Hwasong 6 missiles against targets in Iraq from 1985-2001. The Soviets and Afghan army fired as many as 1700 R-17's against mujahedeen forces in 1988-1992. In the first Iraq War, between January 18 and February 26, 1991, only 40 R-17s were launched by Iraq against Israel and 46 against Saudi Arabia. This handful of launches had enormous operational impact on Coalition operations. Efforts by Coalition air forces to suppress Iraqi launches ran into many problems. Key portions of the target set -- notably the presurveyed launch sites and hiding places used by the mobile launchers -- were not identified before 17 January 1991, and, even in the face of intense efforts to find and destroy them, the mobile launchers proved remarkably elusive and survivable. Iraq's average weekly launch rate of modified Scuds during Desert Storm (14.7 per week) was lower than it had been during the 1988 "war of the cities". While launch rates declined over the course of the Gulf War, the actual destruction of any Iraqi mobile launchers by fixed-wing Coalition aircraft was impossible to confirm. Coalition aircrews reported destroying around eighty mobile launchers; another score or so were claimed by special operations forces. Most of these reports undoubtedly stemmed from attacks that did destroy objects found in the Scud launch areas. But most, if not all, of the objects involved appear to have been decoys, vehicles such as tanker trucks that had infrared and radar signatures impossible to distinguish from those of mobile launchers and their associated support vehicles, and other objects unfortunate enough to provide "Scud-like" signatures. Over the 43 days of Desert Storm, roughly 1,500 strikes were carried out against targets associated with Iraqi ballistic missile capabilities. Maximum range: 300 km (180 mi). Boost Propulsion: Storable liquid rocket. Stage 1. 1 x R-17. Gross Mass: 5,385 kg (11,871 lb). Empty Mass: 1,645 kg (3,626 lb). Thrust (vac): 93.100 kN (20,930 lbf). Isp: 251 sec. Burn time: 95 sec. Isp(sl): 219 sec. Diameter: 0.96 m (3.14 ft). Span: 1.77 m (5.80 ft). Length: 7.43 m (24.37 ft). Propellants: Nitric acid/Kerosene. No Engines: 1. Engine: Isayev R-17. Other designations: 8K14, SS-1C Scud B, 9K72 Elbrus. Status: Out of Production. Comments: Developed from Russian storable fuel tactical missile. Original R-11 designed by Korolev OKB, subsequent developments by Makeyev OKB. Using calculations of Gerald Bull, stretched and clustered as basis of Iraqi ICBM/satellite launch vehicle. EKR Stage 1 LOx/Kerosene propellant rocket stage. First stage for Eksperimentalnaya krilataya raketa (experimental winged rocket), Mach 3 ramjet. Boosted second stage to ramjet ignition conditions. I-Scud Russian short-range ballistic missile. Qiam 1 Iranian missile derived from R-17 via North Korea. Family: short range ballistic. Country: Russia. Engines: Isayev R-17. Launch Sites: Kapustin Yar, Point Mugu, Barking Sands, Kapustin Yar V-2, Bigen Island. Stages: R-11 stage, R-17 stage. Agency: Makeyev bureau, Votinsk. Bibliography: 2, 89. 1958 During the Year - . LV Family: R-11. Launch Vehicle: R-17. Development of the R-17 begins - . Nation: Russia. In 1958-1959 Makeyev designed and built the first mock-up of a new design missile to rectify the shortcomings of the R-11. The R-17 would later become infamous around the world as the 'Scud-B'. The decision was made to devote the Makeyev bureau to sea-launched missiles, and in 1959 the program was transferred to Votkinsk Machine Building Plant. 1959 December 12 - . Launch Site: Kapustin Yar. LV Family: R-11. Launch Vehicle: R-17. 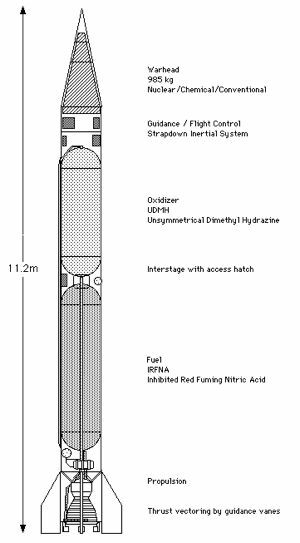 R-17 (Scud B) first launch - . Nation: Russia. Agency: MVS. Apogee: 150 km (90 mi). The program was conducted by the Votkinsk Machine Building Plant. There design work continued with first launch in 1961 and acceptance into military service in 1964..
1959 December 24 - . Launch Site: Kapustin Yar. LV Family: R-11. Launch Vehicle: R-17. ZI - . Nation: Russia. Agency: MVS. Apogee: 150 km (90 mi). 1960 Feb - . Launch Site: Kapustin Yar. LV Family: R-11. Launch Vehicle: R-17. Nation: Russia. Agency: MVS. Apogee: 150 km (90 mi). 1961 Sep - . Launch Site: Kapustin Yar. LV Family: R-11. Launch Vehicle: R-17. Last LKI - . Nation: Russia. Agency: MVS. Apogee: 150 km (90 mi). 1964 Duing the year - . LV Family: R-11. Launch Vehicle: R-17. R-17 (Scud B) accepted for military service - . Nation: Russia. 1964 February 5 - . 06:00 GMT - . Launch Site: Kapustin Yar. Launch Complex: Kapustin Yar V-2. LV Family: R-11. Launch Vehicle: R-17. FAILURE: Failure. Nation: Russia. Agency: MVS. Apogee: 0 km (0 mi). 1964 February 11 - . 12:00 GMT - . Launch Site: Kapustin Yar. Launch Complex: Kapustin Yar V-2. LV Family: R-11. Launch Vehicle: R-17. FAILURE: Failure. 1964 March 15 - . 14:12 GMT - . Launch Site: Kapustin Yar. Launch Complex: Kapustin Yar V-2. LV Family: R-11. Launch Vehicle: R-17. Nation: Russia. Agency: MVS. Apogee: 278 km (172 mi). 1964 April 8 - . 08:41 GMT - . Launch Site: Kapustin Yar. Launch Complex: Kapustin Yar V-2. LV Family: R-11. Launch Vehicle: R-17. 1964 April 25 - . 06:05 GMT - . Launch Site: Kapustin Yar. Launch Complex: Kapustin Yar V-2. LV Family: R-11. Launch Vehicle: R-17. FAILURE: Failure. 1964 July 18 - . 04:30 GMT - . Launch Site: Kapustin Yar. Launch Complex: Kapustin Yar V-2. LV Family: R-11. Launch Vehicle: R-17. Nation: Russia. Agency: MVS. Apogee: 250 km (150 mi). 1964 August 12 - . 03:00 GMT - . Launch Site: Kapustin Yar. Launch Complex: Kapustin Yar V-2. LV Family: R-11. Launch Vehicle: R-17. Nation: Russia. Agency: MVS. Apogee: 246 km (152 mi). 1964 September 2 - . 16:45 GMT - . Launch Site: Kapustin Yar. Launch Complex: Kapustin Yar V-2. LV Family: R-11. Launch Vehicle: R-17. FAILURE: Failure. 1964 October 10 - . 07:00 GMT - . Launch Site: Kapustin Yar. Launch Complex: Kapustin Yar V-2. LV Family: R-11. Launch Vehicle: R-17. Nation: Russia. Agency: MVS. Apogee: 254 km (157 mi). 1964 October 16 - . 12:10 GMT - . Launch Site: Kapustin Yar. Launch Complex: Kapustin Yar V-2. LV Family: R-11. Launch Vehicle: R-17. 1964 October 29 - . 12:15 GMT - . Launch Site: Kapustin Yar. Launch Complex: Kapustin Yar V-2. LV Family: R-11. Launch Vehicle: R-17. Nation: Russia. Agency: MVS. Apogee: 248 km (154 mi). 1964 November 28 - . 11:14 GMT - . Launch Site: Kapustin Yar. Launch Complex: Kapustin Yar V-2. LV Family: R-11. Launch Vehicle: R-17. 1964 December 21 - . 09:44 GMT - . Launch Site: Kapustin Yar. Launch Complex: Kapustin Yar V-2. LV Family: R-11. Launch Vehicle: R-17. 1965 - . Launch Site: Kapustin Yar. LV Family: R-11. Launch Vehicle: R-17. Long range R-17 - . Nation: Russia. Agency: MVS. Apogee: 250 km (150 mi). 1965 January 15 - . 15:00 GMT - . Launch Site: Kapustin Yar. Launch Complex: Kapustin Yar V-2. LV Family: R-11. Launch Vehicle: R-17. 1965 January 30 - . 05:15 GMT - . Launch Site: Kapustin Yar. Launch Complex: Kapustin Yar V-2. LV Family: R-11. Launch Vehicle: R-17. Nation: Russia. Agency: MVS. Apogee: 206 km (128 mi). 1965 February 12 - . 12:00 GMT - . Launch Site: Kapustin Yar. Launch Complex: Kapustin Yar V-2. LV Family: R-11. Launch Vehicle: R-17. 1965 February 20 - . 06:30 GMT - . Launch Site: Kapustin Yar. Launch Complex: Kapustin Yar V-2. LV Family: R-11. Launch Vehicle: R-17. FAILURE: Failure. 1965 March 5 - . 11:00 GMT - . Launch Site: Kapustin Yar. Launch Complex: Kapustin Yar V-2. LV Family: R-11. Launch Vehicle: R-17. 1965 March 13 - . 08:20 GMT - . Launch Site: Kapustin Yar. Launch Complex: Kapustin Yar V-2. LV Family: R-11. Launch Vehicle: R-17. Nation: Russia. Agency: MVS. Apogee: 207 km (128 mi). 1965 April 24 - . 10:00 GMT - . Launch Site: Kapustin Yar. Launch Complex: Kapustin Yar V-2. LV Family: R-11. Launch Vehicle: R-17. 1965 May 26 - . 17:30 GMT - . Launch Site: Kapustin Yar. Launch Complex: Kapustin Yar V-2. LV Family: R-11. Launch Vehicle: R-17. Nation: Russia. Agency: MVS. Apogee: 231 km (143 mi). 1973 October 22 - . 16:50 GMT - . Launch Site: Deversoir. LV Family: R-11. Launch Vehicle: R-17. Weapon - . Nation: Egypt. Apogee: 100 km (60 mi). R-17E - . Nation: Egypt. Apogee: 100 km (60 mi). 1977 Oct - . Launch Site: Scud Batteries. LV Family: R-11. Launch Vehicle: R-17. Nation: Iraq. Apogee: 100 km (60 mi). 1980 Nov - . Launch Site: Scud Batteries. LV Family: R-11. Launch Vehicle: R-17. 69 against Iran - . Nation: Iraq. Apogee: 100 km (60 mi). 1981 Apr - . Launch Site: Scud Batteries. LV Family: R-11. Launch Vehicle: R-17. 1981 Jun - . Launch Site: Scud Batteries. LV Family: R-11. Launch Vehicle: R-17. 1981 Nov - . Launch Site: Scud Batteries. LV Family: R-11. Launch Vehicle: R-17. 1981 Dec - . Launch Site: Scud Batteries. LV Family: R-11. Launch Vehicle: R-17. 1982 May - . Launch Site: Scud Batteries. LV Family: R-11. Launch Vehicle: R-17. 1982 Jul - . Launch Site: Scud Batteries. LV Family: R-11. Launch Vehicle: R-17. 1982 Sep - . Launch Site: Scud Batteries. LV Family: R-11. Launch Vehicle: R-17. 1982 Dec - . Launch Site: Scud Batteries. LV Family: R-11. Launch Vehicle: R-17. 1983 Feb - . Launch Site: Scud Batteries. LV Family: R-11. Launch Vehicle: R-17. 1983 May - . Launch Site: Scud Batteries. LV Family: R-11. Launch Vehicle: R-17. 1983 Aug - . Launch Site: Scud Batteries. LV Family: R-11. Launch Vehicle: R-17. 1983 Oct - . Launch Site: Scud Batteries. LV Family: R-11. Launch Vehicle: R-17. 1983 Nov - . Launch Site: Scud Batteries. LV Family: R-11. Launch Vehicle: R-17. 1983 Dec - . Launch Site: Scud Batteries. LV Family: R-11. Launch Vehicle: R-17. 1984 Feb - . Launch Site: Scud Batteries. LV Family: R-11. Launch Vehicle: R-17. 1984 Mar - . Launch Site: Scud Batteries. LV Family: R-11. Launch Vehicle: R-17. 1984 Jun - . Launch Site: Scud Batteries. LV Family: R-11. Launch Vehicle: R-17. 1984 Jun? - . Launch Site: Al Amarah. LV Family: R-11. Launch Vehicle: R-17. Nation: Iraq. Agency: IQ224. Apogee: 100 km (60 mi). 1984 Oct - . Launch Site: Scud Batteries. LV Family: R-11. Launch Vehicle: R-17. 1984 Oct - . LV Family: R-11. Launch Vehicle: R-17. 1985 Mar - . Launch Site: Scud Batteries. LV Family: R-11. Launch Vehicle: R-17. 54 launches vs Iran - . Nation: Iraq. Apogee: 100 km (60 mi). 1985 Apr - . Launch Site: Scud Batteries. LV Family: R-11. Launch Vehicle: R-17. 22 launches vs Iran - . Nation: Iraq. Apogee: 100 km (60 mi). 1985 May - . Launch Site: Scud Batteries. LV Family: R-11. Launch Vehicle: R-17. 15 launches vs Iran - . Nation: Iraq. Apogee: 100 km (60 mi). 1985 Aug - . Launch Site: Scud Batteries. LV Family: R-11. Launch Vehicle: R-17. Test launch - . Nation: Iraq. Apogee: 100 km (60 mi). 1986 April 15 - . Launch Site: Tripoli. LV Family: R-11. Launch Vehicle: R-17. Lampedusa - . Nation: Libya. Apogee: 100 km (60 mi). 1987 Jan - . Launch Site: Scud Batteries. LV Family: R-11. Launch Vehicle: R-17. 27 launches vs Iran - . Nation: Iraq. Apogee: 100 km (60 mi). 1987 February 11 - . Launch Site: Scud Batteries. LV Family: R-11. Launch Vehicle: R-17. Al Hussein R&D 1 - . Nation: Iraq. Apogee: 10 km (6 mi). 1987 Mar - . Launch Site: Scud Batteries. LV Family: R-11. Launch Vehicle: R-17. 9 launches vs Iran - . Nation: Iraq. Apogee: 100 km (60 mi). 1987 April 21 - . Launch Site: Scud Batteries. LV Family: R-11. Launch Vehicle: R-17. Al Hussein R&D 2 - . Nation: Iraq. Apogee: 10 km (6 mi). 1987 April 28 - . Launch Site: Scud Batteries. LV Family: R-11. Launch Vehicle: R-17. Al Hussein R&D 3 - . Nation: Iraq. Apogee: 10 km (6 mi). 1988 Mar - . Launch Site: Scud Batteries. LV Family: R-11. Launch Vehicle: R-17. 181 launches vs Iran - . Nation: Iraq. Apogee: 100 km (60 mi). 1990 December 26 - . Launch Site: Al Nikheb. LV Family: R-11. Launch Vehicle: R-17. Launch trailer test - . Nation: Iraq. Apogee: 100 km (60 mi). 2010 August 20 - . Launch Complex: Damghan. LV Family: R-17. Launch Vehicle: Qiam 1. Shahab RV - . Nation: Iran. Apogee: 100 km (60 mi). Test mission..
2016 March 8 - . Launch Site: Qom. LV Family: R-17. Launch Vehicle: Qiam 1. 2017 November 4 - . 17:07 GMT - . Launch Site: Sa'dah. LV Family: R-17. Launch Vehicle: Burkan 2H. RV/Warhead - . Nation: Iran. Apogee: 150 km (90 mi). Combat launch. Impacted Riyadh..
2017 November 4 - . 17:07 GMT - . Launch Site: Yemen. LV Family: R-17. Launch Vehicle: Burkan 2H. RV/Warhead - . Nation: Yemen. Apogee: 150 km (90 mi). Combat launch. Impacted Riyadh..
2017 December 19 - . Launch Site: Sa'dah. LV Family: R-17. Launch Vehicle: Burkan 2H. 2018 January 30 - . Launch Site: Yemen. LV Family: R-17. Launch Vehicle: Burkan 2H. Burkan RV - . Nation: Yemen. Apogee: 100 km (60 mi). Combat launch. Impacted Riyadh Airport..
2018 March 25 - . 20:25 GMT - . Launch Site: Yemen. LV Family: R-17. Launch Vehicle: Burkan 2H. 2018 April 11 - . Launch Site: Yemen. LV Family: R-17. Launch Vehicle: Burkan 2H. 2018 May 8 - . Launch Site: Yemen. LV Family: R-17. Launch Vehicle: Burkan 2H. Burkan RV - . Nation: Yemen. Apogee: 100 km (60 mi). Combat launch. Impacted Riyadh..
2018 October 1 - . Launch Site: Kermanshah. LV Family: R-17. Launch Vehicle: Qiam 1. Warhead - . Nation: Iran. Apogee: 200 km (120 mi). Combat launch. Impacted Syria.